A friend recommended trying Gold Bond lotion for my terribly dry skin, including the heels of my feet, caused mostly by the Winter months. I decided to try the softening kind. I love this lotion. It is thick, yet it absorbs well and quickly and it lasts a long time. It really does not have a scent which is fine with me. 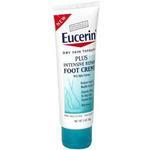 It has done wonders for the heels on my feet and it has completely moisturized my arms and legs as well. I put it on when I get out of the shower and at night before I go to bed. I don't normally buy lotions above $2 because I am on such a tight budget, but I am hooked on this stuff now and have to keep buying it. Love this lotion. It stays on from shower to shower and keeps me moisturized. I have extremely dry skin and this works wonderfully. My only problem is getting it out of the bottle. It is really thick. I generally cut the bottle in half and scoop the lotion out into a container so I can just dip it out with my hand. I have pretty much quit using any other lotion. I love gold bond brad. I use this lotion a lot. I highly recommend this lotion and brand. I use this product on my whole body. I usually put it on after a bath/shower or before bedtime. I like to buy this brand of lotion because my legs often get really dry. I believe the best time to apply it on is after a shower. That is when I have noticed the best results for me. My mom has this lotion as well and it is were I have first used it. It has been one of the few lotions that has had a good result and not left me feeling dry or sticky. The only negative remark is it doesn't have much of a scent and I like fragrance on my lotions. Say goodbye to those iffy feet! Because of the medication I take, my feet are often really dry. I mean, really really dry. I have tried so many things, and every lotion that I used for my feet seemed to fail. It's annoying to spend the money on something, and end up not being able to use it for the reason you bought it in the first place. 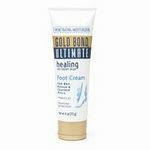 Then, I tried Gold Bond Ultimate Healing Foot Therapy. I haven't had trouble with my feet drying out since then. Depending on how dry your feet are, you may use it less than I do. 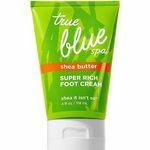 I apply it about twice a day because that is how much it takes for me feet to keep from drying out and the skin getting tough. To me, it's worth it. I had some money left on a gift card so I decided to pick up Gold Bond Ultimate softening Lotion with Shea Butter. I am very big on products that have Shea Butter so this purchase was a no brainer. My first impressions of this lotion was that it's thick. It's not thick in a bad way either. It's not greasy or heavy feeling like most lotions with this consistency. I rubbed this lotion on my body and it absorbed very quickly into my skin. My skin felt very smooth and soft instantly. I was really impressed that I was able to wash my hands and still maintain a decent level of moisture from the lotion. I have never been able to wash my hands and not have to reapply lotion to them. I continued to use this lotion for several weeks and my skin would get softer each day. I would definitely recommend Gold Bond Ultimate Softening Lotion with Shea Butter to anyone looking for a lotion that is long lasting throughout the day with no side effect. This is a great all over lotion that really moisturizes. I was really surprised by this lotion. 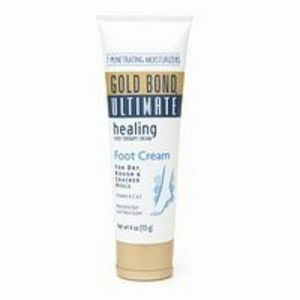 I always thought that Gold Bond was a formula that was just for feet and that it didn't smell very good because not many foot creams do. I saw this when I had a very dry face after being ill and decided to give it a try because it was so inexpensive. I know my grandmother loves her Gold Bond foot lotion so I figured it must be a good formula and if nothing else, it would make me feel softer even if it smelled bad. Surprisingly it doesn't smell bad at all. It's very soft and subtle scented and smells like a regular hand lotion or cream would smell. The lotion isn't too thick but it isn't too thin either. It comes out easy and goes on very smooth. It absorbs quickly and doesn't sit on my skin and feel heavy or greasy. It can be reapplied almost immediately if I feel like I need more moisture. It healed my cracked and dry flaking face after just a couple days. I noticed an effect immediately overnight and was so thrilled with this lotion that I went back and bought another one and have been using it as an all over body lotion. It doesn't seem to have any perfumes or dyes that irritate my skin. I have normally sensitive skin and this has worked miracles on it. I wish it was organic and all natural but not every product can be for the price. I'm still very satisfied with the lotion. Scent It smells like a normal lotion and not heavy at all. Absorption It's great for applying in layers because it absorbs so quickly into my thirsty skin. Effectiveness I noticed an effect overnight with this lotion. This is by far the best lotion on the market. I have always suffered from dry patchy, scaly skin and have tried many, many lotions over the years without success. A store representative suggested this brand of lotion to me and I decided to give it a try. Although I was skeptical after trying so many failing lotions, I was very surprised when I noticed a huge difference to my skin after only the first use. One of my favorite thing about it is that it does not feel oily. It soaks into the skin nicely and really does keep it moisturized and the bonus is that my skin feels really soft! Scent If you are looking for a lotion with a strong feminine fragrance this may not be your favorite but I like the clean fresh scent that it has. Absorption This lotion soaks into the skin really well causing the skin to look even and moisturized. Goodbye scaly legs! Effectiveness This product is very effective! I cannot say enough about how well this lotion works and delivers what it promises. Soft skin, moisturized skin and no greasy feeling.